Recently I have been feeling inspired by 1960s fashion of the big hair and short dresses variety. Maybe it's the hot weather, but all I want to do is live out of these little dresses that have made their way into my wardrobe over the years. It also gives me a chance to breathe some new life into modern items which I don't wear much any more, until I have the money to replace them all with vintage. 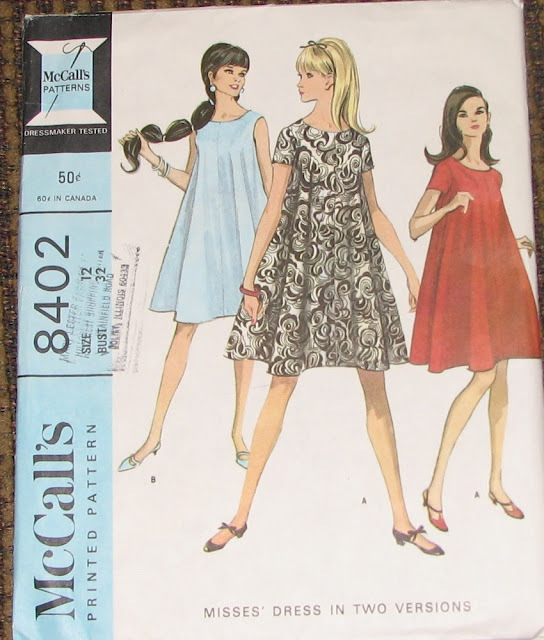 There are many examples of 60s mini dresses which I am inspired by - although of course "mini" is relative, and mini dresses from the 60s tend to be longer than what would be considered a mini dress today. This is a winner in my books, as it means I tend to feel less self conscious, whilst also feeling like I have the look of the shorter dresses. For me, for some reason or another, 60's dresses are for the winter. Even though mini skirts are not the healthiest idea here in the far north, even when worn with the thickest possible wool tights. I haven't really dabbled with 60s dresses for the winter - last year I was all about bundling up and trying to keep warm by any means possible but I will probably try and approach it with more style this time around! Adorable - and super stylish! The colours in this warm weather frock are so lovely. I just adore purple and turquoise together (it was a favourte colour combo of mine as a child).